KD let me go shoe shopping last night without his supervision. Usually, that is not a good idea. Not because I would spend too much, but because sometimes I buy things that are just weird and I end up hating them. KD is my voice of reason. However, he needed to work on his CMA application (now that he passed the exam, he has to apply with this lengthy application which needs to be submitted before we go on holidays next week). So JK and I went to find me some sandals. The last time I bought sandals was about 7 years ago. I usually buy black or brown shoes because I generally only have about 4 or 5 pairs of shoes at a time. But this time I took a risk and bought red! I figure it's ok since I wear a lot of red, and it's summer, and it's fun. I probably wouldn't buy red winter boots though. At this point I don't think I will regret this, but you never know. The sandals are really comfortable. I learned how to do the flowers on my toes from this lovely new blog that I discovered but usually don't have time to read. 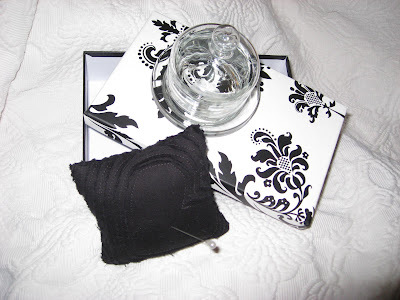 I've decided to put the tiny butter dish in with the black and white giveaway. I may go get another one to add to the garden giveaway. Today I'm still working away at sprucing up our house. It's ridiculous that every time I turn around something new needs to be painted. I now need to touch up the bathroom vanity because the baby-proofing latch has scratched the paint. Sigh. We have decided to leave the half-bath updates until we get back because KD's application is more important at this point. But I'm thinking of painting it all white, with accents of tan and brown. What do you think? Oh, speaking of paint colours, for Jill and Heather, who asked about our bedroom paint colour, it's "Wainscott Green" from General Paint. I had to run downstairs to check, since it was painted by the previous owner. Lucky for you she left the paint can for us! I'll show you the rest of the bedroom once KD picks up his clothes. Every day he comes home and says "you didn't put away my clothes yet?" I say "no, I'm not going to". Now that makes me sound like a bad housewife, but you should understand that KD is dreadfully picky about how is clothing is put away, so the most I ever do is fold it and put it in his basket. That said, I am also very picky about how my clothes are put away. So we just each do our own. Can't wait 'til JK is old enough to put away her own clothes too! Hi Jo! Those sandals are adorable! I love red. I was actually just last night thinking how when fall comes around I think I might need a pair of red cowboy boots (I don't know why I was thinking that, but I was). And I can't believe you painted those flowers yourself! So cute! Cute red sandals! Would you believe I've been trying to get new brown sandals all summer and I still don't have them?! I'm hoping the ones that are due to be delivered today will work. Love the toenail tutorial too, I just may need to try that! Love your toenails!! Cute shoes! White with tan and brown is totally a no-go in my opinion. I hate white with accents of tan and brown. My whole stupid rental crappy townhouse is white with accents of tan and brown. How about if you do white walls with black wrought iron wall hanging and yellow or purple accent colour? Keep the wall colour light so the rooms seems bigger. You could even get that textured paintable wallpaper that would look cool, it would give the wall some depth so that the white doesnt look so plain. I hate laundry and putting it away is my downfall... ugh. I think white with brown and tan is great for selling a house. I absolutely love your shoes and the toes..and anything else red! I'd even buy a pair of red boots for winter. Red rocks! Cute sandles!! If I had pretty feet I would go buy some too!! Thank You for sharing the paint color!! I will have to look online and see who sells that in our area! I had to laugh about the laundry. My husband could care less- which is a good thing. I am very particular about doing laundry but then after it comes out of the dryer it stays in the basket- unfolded- for a looooong time! We are usually digging wrinkled clothes out to wear! It is so pathetic!